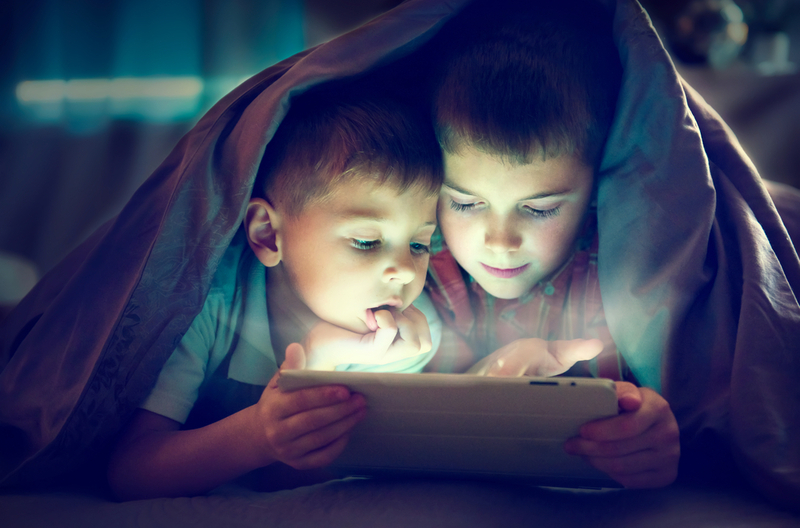 Many parents are worried about their children’s eyesight and development when it comes to the use of some of today’s technology, especially the omnipresent screens found in use every day of our lives. Kids could be risking acuity (the clarity of their vision) or other sight-related problems like nearsightedness (also known as myopia). Skin Damage – and ultimately lead to our skin ageing quicker. The first thing we can do as parents is to set a good example for our children. In a recent study, behavioral experts found that children were almost three-and-a-half times more likely to watch excessive television if their parents did the same. The “do as I say and not as I do” type of mentality doesn’t necessarily apply in many cases and this is certainly one of those instances. To help prevent eyestrain, the twenty-twenty-twenty rule should be applied to both parents and their children. This principle asks screen users to focus on something around twenty feet in the distance, every twenty minutes for about twenty seconds. This process allows our eyes to relax and refocus giving them a much needed break from screen time which is sometimes unavoidable, like doing homework for example. Encourage your youngsters to embrace this practice (even if they need to use a timer) and closely monitor younger children’s screen time to help prevent eye strain. Toddlers under 18 months should only be using these devices on rare occasions and when they’re less than two years of age they can be slowly introduced to these screens. From those two to five years old, screen time should be limited to only one hour of high-quality or educational programming per day. For school age children, strict limits and monitoring should be used to ensure the use of technology doesn’t interfere with sleep, physical activity and other healthy routines. They also recommend times where there should be no media allowed whatsoever, driving and dinnertime are two excellent examples. Parents should also discuss internet safety, appropriate online behaviors and talk to their children regularly about important topics like cyberbullying. Some parents have gone to the extreme of removing televisions and other screens from their homes altogether (which is not a bad idea) or unplugging their cable provider. While these are definitely options, at the very least, parents should ensure that desktop computers or television sets are only located in a common area of the house that’s easy to monitor. Encourage and participate in other forms of family-friendly types of entertainment. Get down on the floor with younger kids and play with them. Older children can engage in board games or other non-technological activities on designated family nights. Parents will do practically anything to protect their children and even though technology is a big part of our lives, it shouldn’t come at the expense of our kid’s overall wellbeing. They’ll get plenty of screen time at school and times when you’re not with them, so being unplugged at home won’t be that big of a burden for them to bear.